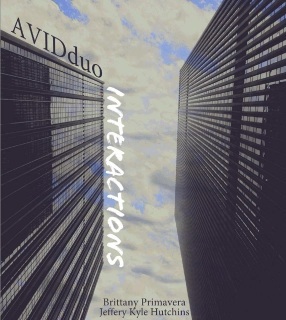 AVIDduo, which includes flutist Brittany Primavera and saxophonist Jeffery Kyle Hutchins, has released a CD of new music for this combination of instruments; their goal is to promote new repertoire, including the specific works on this recording. Right away, it is obvious this duo has included repertoire that really stretches the sonic qualities of these instruments. They incorporate extended techniques and create fascinating timbres between different combinations of flute, piccolo, alto saxophone, and baritone saxophone. Piano is included on one track which introduces a new timbre. Extended techniques are another way of introducing interesting sounds. Joshua Clausen’s We’re from the Internet combines traditional chamber music ideas with electronic music. There are spoken samples included in this work. Cracked Brick by Anna Garman is based around two contrasting themes and was commissioned by AVIDduo. Lenka Štůralová’s Interactions, dedicated to AVIDduo, focuses on the interactions that are possible between the flute and saxophone. Ted Moore’s …deepities has some very engaging moments, which are largely an exploration of timbre. According to the liner notes, a “deepity” is a statement that is apparently profound but actually asserts a triviality on one level and something meaningless on another.” This is another work commissioned by AVIDduo. Ever Present by Alvin Lucier features tone waves over which the flutist, saxophonist, and pianist play long tones. Beats are produced at various speeds based on how close the tunings are. This is a captivating, meditative work. BAAYAMI: From the Sky by Mark Oliveiro is inspired by the ancient people of prehistoric Australia. In addition to the instrumental sounds, it also features vocalizations from the performers. Paul Hayden’s Janus is in two movements: Janua Coeli, or“Gate of Heaven,” through which celestial beings enter and Janua Inferni , or “Gate of Hell,” through which humans enter. They are highly contrasting and feature extended techniques. The last work on this release is Peter John’s Asteroid Baptistina. This asteroid is the one that is believed to have brought about the end of the age of dinosaurs and the beginning of a new era. He relates this idea to the current status of classical music: how do classical performers relate to new technology? John answers this question by combining flute and saxophone sounds and remixing them to deliver a convincing work that is a nice closer to this album. If you are interested in expanding your knowledge of flute and saxophone repertoire or if you have such an ensemble, there is certainly plenty of inspiration here. Learn more about AVIDduo’s work at their website, www.AVIDduoMusic.com. This review was originally published in the May 2014 issue of The Flute View magazine. Subscribe here!